But this sign inspired to spin some fiction! Here’s a little blurb from the first part of “The Devil Within” (still in editing, but hopefully will be out in May), just to give you a little teaser! Everyone has seen the sign. 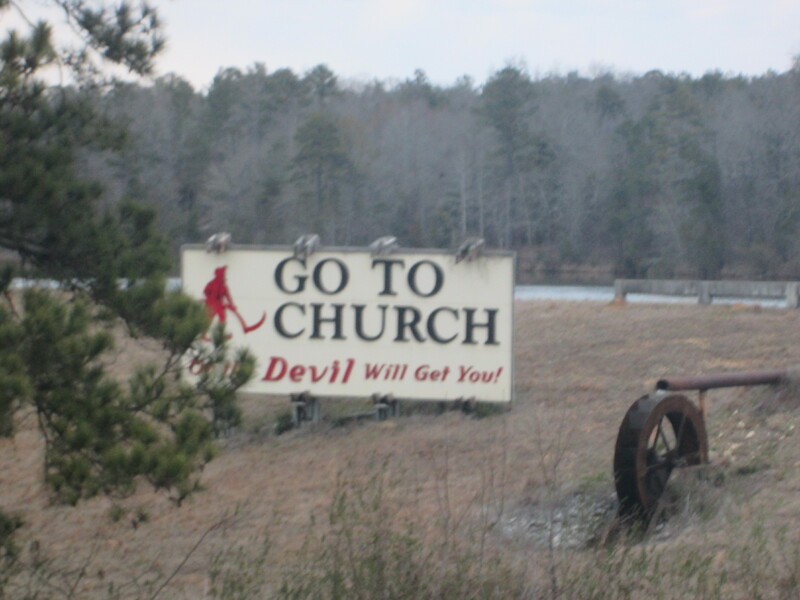 It sits on the highway between Montgomery and Birmingham: Go to Church or the Devil Will Get You! A caricature of a devil holding a red pitchfork with eyes burning holes into every car that passes by. My pop put up that sign. It was the beginning of the end in my eyes. He did it right after the accident. He went down the street to Baker’s Seed and Feed and Hardware Shop, squeezing my hand too hard as he dragged me in—the only child left. He bought red paint and some two-by-fours, and then we hopped back into the Ford truck and drove all the way down to the end of the property next to where the pond stands. He handed me a Coca-Cola, and I lay under a tree thinking about how Momma had looked like an angel in her casket and wondering when I’d ever see her again. The Coca-Cola almost burned going down my throat. “What you think, boy?” he asked, spitting some tobacco out of the wad in his cheek. I stood up and walked around, looking at the sign. He had traced the devil from an old sign, colored him in, painted words in bright red, and then put it up. It looked crude, but I guessed it would do. I was more interested in finding some peanuts to add to my Coca-Cola, but I nodded enthusiastically like it was the best piece of artwork I’d ever seen. ← Flash!Friday: We meet again! Story prompts are everywhere! Great start. Thanks Carolyn! This one has been close to home to me! Thanks Amalie. I’ll keep updating so you know when the release date will be!